Can I Use Laser Treatment For Removing My Facial Hair? Every fortnight we women fuss over our facial hair. 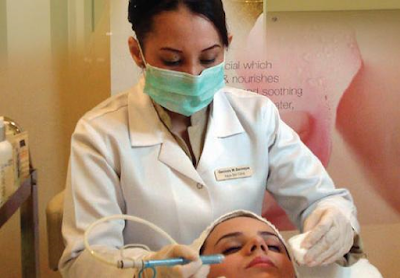 Threading, waxing, peel-off masks, we’ve tried it all. The stinging pain, darkening of the skin tone, rashes, and increased hair growth is what we get in return. Well, there is one fix for this problem- Laser hair removal. Sure, we’ve heard of that before. Tried it too. But can it be used on the face? Is it safe? Yes, it is! Laser treatment for hair removal is now a popular solution for getting permanent hair removal. It’s a tested and proven formula for effectively reducing hair growth. Once you go the laser way, you won’t have to run to the parlor lady ever again. Women have been opting for laser treatment for hair removal from all parts of the body- arms, legs, chest, back and bikini line too. What’s more, even men are finding this method very convenient and hassle-free, as it saves them time from their daily morning routine of shaving and their skin from razor cuts and rashes. While we’ve gotten quite comfortable to having laser lights shone on our arms and legs, exposing our face to it still seems quite scary. And why not? After all, the skin on our face is far more sensitive and quite different compared to other parts of our body. It’s delicate and gets more oily and reacts more easily to various skincare and makeup products. We women are as skeptical to laser treatment for facial hair as we would be to using a razor on our faces. But hey, relax! Expert dermatologists and laser therapists are here to assure us that it’s perfectly safe and normal to remove facial hair using the laser treatment. It is just as normal as getting a laser treatment done for your arms or legs. While threading and waxing have been the most sought after method for getting rid of that peach fuzz on the face, it comes with its share of pain, irritation and not to forget darkening of the skin. Remember how your upper lip started to turn a dark greenish colour? Facial hair makes your face makes your skin tone dull and bleaching does little to help this. Removing your facial hair using the laser treatment is a boon whose effects are long-lasting. Laser treatment reduces hair growth without damaging your skin. It can be done for the chin, upper lip, sideburn and the neck area too. This method targets the hair roots and the pigment directly and blocks hair growth. You don’t have to get embarrassed about your upper lip hair growth between threading sessions anymore. Laser treatment for facial hair removal doesn’t even take as much time as it does for arms or legs. As it is a smaller area with less dense hair growth, it takes lesser time and fewer sessions too, to remove hair completely. Not just women, but men too can opt for this method. For men who are sick and tired of shaving day in and day out, losing their precious morning sleep and suffering from itchy ingrown hair, laser hair technology is the best solution out there. It reduces hair growth and can help men maintain a trimmed, neat beard. At Kaya Skin Clinic, you can get the best permanent laser hair reduction treatment that is US-FDA approved. The expert team of dermatologists and laser therapists take you through a 3-step process to understand and assess your skin type, hair type, and hair growth cycle. They perform a patch test to check for any allergic reactions. Laser treatment for facial hair hardly takes any time. You can get done with it in your lunch break during work! Kaya has the Nd-YAG advanced laser technology that safely removes facial hair. It is designed to treat Indian skin carefully and does not cause any side effects. Laser treatment of facial hair is a safe procedure with little to no discomfort. It is a quick, short duration solution with long term benefits. It enhances your beauty and boosts your confidence. So have no fear, because those lasers are here to make your face shine bright like a diamond. Have you ever felt insecure over your body hair and had to cancel an event because of it? We all have! Unwanted body hair can be a huge burden and make you feel conscious in whatever you wear. Laser hair removal can give you freedom from this insecurity once and for all. It takes away the stress of having to align your style with your body hair cycle. Laser treatment delays hair growth to a great extent. The hair on our head, eyebrows and eyelashes are great because they define your face. Men have facial hair - beard and mustache that makes them look manly. Other than this, nobody likes unwanted hair anywhere else on their body. Women have been trying different methods to get rid of the unwanted hair - waxing, shaving, epilation, you've tried it all! Laser hair removal treatment has been around for quite some time now. This procedure uses a laser light that not only removes the hair on the skin but penetrates deeper and destroys hair follicles. This hair removal treatment takes around 3-4 sessions to be fully effective. Some people might need additional touch-up sessions as every individual is different. Laser hair removal hardly causes any pain and it doesn’t affect the surrounding skin whereas waxing zaps out the unwanted hair from your body and may cause rashes. Which one is better - Waxing or Laser Hair Removal? Waxing is basically just zapping out the unwanted hair from the body. You’ll have to apply the wax on the target area, let it dry, and then peel it off which will pull out the hair from the roots. This ensures a long-term effect. However, not all hair might come off at the roots. Because of the different hair length, they might break on the surface as you peel away the wax. With waxing, you also risk the development of ingrown hair. Improperly waxed hair can turn back and grow under the skin. This may lead to red bumps on the skin and can also cause skin infections. Laser Hair Removal Treatment is a procedure that uses laser light to burn off the hair follicle. It will need more than one hair removal session as the treatment targets the hair that is in the growth phase. The expert has to wait before performing the next laser session as not all hair is in the same phase at the same time. A properly performed laser treatment will also ensure that you do not have problems such as partially removed hair or ingrown hair. There are three steps to the laser hair removal treatment. It first starts with understanding the skin type, hair type, hair growth pattern, and thickness. This step is essential as every individual is different. Second, a patch test is performed on the skin to check for any adverse reactions. The final step involves customizing a suitable laser hair removal plan. Laser hair removal treatment might seem a bit pricey at first but it is effective in the long run. You can stay hair-free for much longer periods once you’ve reached the optimum removal stage with laser treatment. You don’t have to spend money on regular monthly sessions for decades, as you’ll have to with waxing. Kaya Skin Clinic is one of the preferred choices for laser hair removal treatment in India. Kaya uses a dermatological tested, US-FDA approved safe laser hair removal treatment. The treatment targets only the hair follicle, leaving the surrounding skin unaffected from the laser. It hardly causes pain or skin infections. They have affordably priced laser treatment packages and also offer attractive discounts on additional touch-up sessions! Head to your nearest Kaya Skin Clinic and book your appointment for a laser hair removal treatment! You try your best to get flawless skin. But there’s always some things that you can’t control. Dark spots, age spots, skin tanning, and post-acne blemishes can leave you with an uneven skin tone. Your usual skin care products won’t be able to help you. This is because the problem lies deep underneath your skin. What you need are new techniques for pigment reduction that can get under your skin. Literally! Melanin, produced by melanocytes, is a pigment that gives your skin and hair its color. Melanin also absorbs harmful UV radiations from the sun to protect the tissues and organs that lie underneath the skin. But there’s only so much radiation that your skin can handle. If a certain area of the skin is exposed to UV radiation for a long time, it can cause excessive production of melanin in that area leading to hyperpigmentation. The melanocytes do this to save that area of skin from suffering further damage. This leads to an uneven deposit of melanin on the skin, creating dark spots and an uneven skin tone. Hyperpigmentation can also occur with age. As your skin gets older, it becomes more susceptible to the sun’s rays. Excess melanin is produced to counteract this, leaving you with age spots on your skin. Melasma is another condition that causes excessive pigmentation. Melasma affects the skin when the body is suffering from extreme hormonal imbalances. These usually occur in women during pregnancy. Melasma may also be seen in women who use oral contraceptives and are on Hormonal Replacement Therapy medication. There are a lot of skincare products that are designed to specifically target this excess melanin. You can use these pigment reducing products to get flawless skin and restore your natural glow. Dermatologists from Kaya have researched and developed a cream for this purpose. Kaya’s Pigmentation Reducing Complex controls hyperpigmentation. It’ll give you relief from skin dullness. This is an instant acting cream that reduces dark spots, skin tanning, age spots, and pigmentation marks. It has Phytic acid and Azelaic acid which inhibits the production of tyrosinase. Tyrosinase is an enzyme that the body uses to produce melanin. By reducing it the cream prevents further pigmentation of the skin. The cream will also hydrate the skin to make it look soft and healthy. There is another procedure that can give you even speedier relief from excess pigmentation. Laser treatments are a revolutionary method of pigmentation reduction. Dermatologists at Kaya use the Q-Switched Laser Treatment. It’s a simple procedure that won't take much of your time. The dark spots, age spots or patchy skin are exposed to a beam of light. The specific wavelength of the laser reacts to the pigment in the skin. This breaks up the excess melanin, leaving you with an even skin tone. The laser is capable of penetrating deep into the skin to effectively break up the excess melanin that is trapped there. It’s also effective on post-acne blemishes. This treatment can also solve your acne issues by killing bacteria that cause pimples. The laser increases the collagen in the skin which can reduce age lines and wrinkles to give you younger looking skin. Depending upon the intensity of hyperpigmentation, it could take up to 6 to 8 sessions to effectively reduce the dark spots and patchy skin on your skin. The Q-Switched Laser Treatment is tested to be safe on Indian skin. This procedure has absolutely no side effects. The precision laser targets the dark spots accurately, so the surrounding healthy skin won’t be exposed to it. This procedure is completely hassle-free and there’s absolutely no downtime. No side effects mean you can return to your daily activities immediately after the procedure. Are the harsh Sun and pollution leaving you with irregular pigmentation? You might need to start giving your skin special care. Fortunately, there are many pigment reducing options that can help you overcome it. Say goodbye to all those painful waxing appointments, messy hair removal creams, and noisy epilators. Kaya Skin Clinic has come up with an easy solution - Laser Hair Removal Treatment. Read on to find out everything you need to know before you get started with this treatment. Laser hair removal treatment has been around for a really long time now. In this process, the hair is removed using a laser light that destroys the hair follicles on your skin. The treatment might take up to 6 sessions to be fully effective depending on the individual. Laser Hair Removal is unique and effective than the existing techniques as this ensures that the hair growth declines. Laser hair removal hardly causes any pain compared to waxing and shaving that can cause rashes and itchiness. This treatment doesn’t damage the surrounding skin. So in short, it can be said that laser hair removal treatment is skin-friendly. The term permanent hair removal might be misleading for some people. Depending on a number of factors like your skin type, hair texture, hair length, genes, and hormones - the amount of hair you're completely able to eradicate may vary. However, the goal at Kaya is to give you the best treatment possible. For this treatment, Kaya uses the latest in laser hair removal technology. When you visit Kaya Skin Clinic for a laser hair removal treatment, it first starts with understanding your hair type, skin type, and the growth pattern of your hair on your body. Then a patch test is done where the laser is tested on a small area of your skin to check for any adverse reactions. And if there are no adverse reactions, then a treatment plan is customized for you. Head to your nearest Kaya Skin Clinic for a beautiful, smooth, and hair-free skin! A team of expert dermatologists at Kaya will make sure you get the best treatment. Kaya uses a dermatologically tested, US-FDA approved safe laser hair removal treatment. The treatment targets only the hair follicle leaving the surrounding skin unaffected from the laser. It works by targeting hair specifically in its growth cycle. Not every strand of hair on your body is at the same stage of the cycle simultaneously and this is why you might need about 6 sessions and a few touch-ups later. If after the treatment it is found that you need more laser sessions, you get a 30% discount as well! Laser hair removal cost is the main reason why people don’t opt for this treatment over waxing and shaving. Most of the Kaya Skin Clinic laser hair removal reviews have mentioned that the cost is the only con of the treatment. Laser treatment may be a bit pricey but it is the most effective method of permanent hair reduction. But once you get this treatment, you’ll never have to worry about unwanted hair growing on your skin and you can wear whatever you want, whenever you want! Kaya Skin Clinic is one of the top preferred choices for laser treatment for hair removal in India. Kaya has affordably priced laser treatment packages and they also offer attractive discounts on additional touch-up sessions! Laser hair removal treatment is the fix that’ll end all your hurried visits to the parlor. It’s safe and doesn’t damage your skin. It’ll be over before you know it! So don’t wait anymore and book an appointment at Kaya for a laser hair removal treatment! Winter brings along with it Christmas and merriment, and also various skin problems such as dryness, flaky skin, rashes, irritation, redness, and the list go on. With the weather change wreaking havoc on your skin, it is time to give it some extra love, care, and nourishment. Winter vs. Skin - Who wins? - Keep yourself hydrated, inside out: Constantly keep a moisturising lotion with you while you are out and apply it every now and then. Apart from using a moisturiser, make sure you keep your body hydrated with a lot of water and the right kind of food to replenish moisture. - Use a sunscreen, even though you hardly see the sun: Harmful rays of the sun are even present in the winter, making your skin susceptible to sun damage. Always use a sunscreen or beauty products with built-in sunscreen to protect your skin. - Exfoliate and cleanse your skin regularly: One the major winter problems is flaky skin. Imagine welcoming Christmas with cracked, flaky skin. Ouch! Use an exfoliating scrub to remove the flaky skin. Avoid the usage of soaps as they lead to inflammation and dryness. Looking for that perfect solution for all your skin woes during winter? Kaya Skin Clinic is here to help you with just that. Kaya understands the needs of your skin and provides you with some of the best services. Their diligent services and advanced technology come together to provide you with one of the efficient skin care treatments and therapies. They have a plethora of products that treat and repair various skin issues to give you flawless skin. The Deep Nourish Elbow and Foot Cream from Kaya is formulated with shea butter and coconut oil that softens rough skin on the feet and the elbows. It refreshes and rejuvenates sore and tired skin on your feet, and deeply nourishes the thick skin around the elbows and knees. This foot care cream effectively treats calloused elbows and cracked feet for soft, moisturized skin. The Daily Use Body Lotion from Kaya effectively prevents moisture loss from the skin all day. Its shea butter and mango butter enriched formula nourishes your skin and keeps it hydrated. This Kaya body lotion softens your skin and keeps it moisturized for long intervals. It replenishes vital oils and gives you healthy looking skin. Say goodbye to dry skin with the Intense Hydration Body Lotion from Kaya. Formulated with shea butter and kokum butter, it locks moisture in your skin throughout the day. With extreme weather conditions depriving your skin of moisture, this body lotion keeps your skin hydrated. Regular usage softens the skin and protects it from the harsh winter. Looking for that ideal all-in-one product that would moisturise your skin and reduce dullness? Look no further than Kaya’s White Protect Body Lotion. It protects your skin from the UVA and UVB rays while keeping it hydrated. It prevents skin darkening and evens out the skin tone. Formulated with SPF 13, it prevents sun damage and pampers your skin for a bright, radiant look. Kaya understands the importance of keeping your skin healthy and nourished during the harsh winter. Its wide variety of skin care products effectively treat your skin and keeps it healthy. Bid farewell to all your winter skin woes with Kaya body care and flaunt smooth, flawless skin.